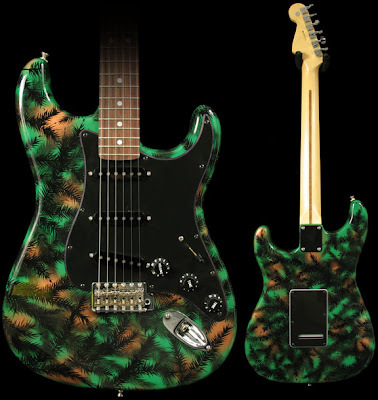 The Music Zoo is currently listing this rather "outdoorsy" themed Strat which might appeal to you Rocky Mountain or Pacific Northwest, Eddie Bauer types. Hopefully it's tick-free. "Here we have a cool Fender Highway One Strat that has been repainted "Evergreen". The guitar has an alder body, maple neck, rosewood fretboard, and Fender tuners. It has been resprayed with the custom paint job, and it has the guard and backplate changed to black. It also comes with Lindy Fralin pickups, which are the Blues Specials I believe. The guitar also has the Fender 60th Anniversary logo on the back of the headstock. Overall the guitar plays quite well. It's a USA Fender guitar, and with the upgraded pickups it has a pretty killer tone. It ships in a nice non-original hardshell case.